One of the main difficulties of writing music is predicting how it will sound in real life. All compositions sound great in the mind, but when played by real musicians they can sometimes turn out to be a horrible travesty of what was originally imagined. Traditionally, novice composers have overcome this problem by trial and error; once a piece of music has been played, basic errors (writing notes that fall outside an instrument's range), miscalculations (dynamic imbalances between ensembles) and other blunders can be identified and, hopefully, eradicated. This of course assumes that you have musicians on hand to demonstrate your musical ideas. That's easy enough if you're in a band with a few mates, but when it comes to checking out your ideas with an 80-piece symphony orchestra — well, you're in trouble. Though the education programmes run by some UK orchestras have made them more accessible to the public, you're unlikely to get them to play your piece unless you're a name composer and therefore (presumably) well past the experimentation stage! Dr. Jack Jarrett faced this problem younger than most — he began composing at the tender age of nine and first heard his music played by an orchestra when he was 16. Since then, Dr. Jarrett's works have been performed by more than 50 major orchestras; he has also attained a diploma in conducting and taught at the Berklee College of Music. However, it's his parallel career as a software developer which concerns us here. Eighteen years ago, Jarrett designed Musicprinter Plus, an MS-DOS program which combined score publishing with MIDI playback. In 1998, he joined forces with his daughter and her husband to found the Virtuosoworks software company, with a view to developing a new notation program capable of orchestral playback. The project was fully realised when the family trio decamped to India and spent 18 months assembling a programming team to complete the software. Virtuosoworks now operate from their HQ in North Carolina and sell Notion via a Swedish distribution company, making this a truly international effort! Notion's easy-to-use Score Setup window.It's not uncommon to find orchestral samples bundled with notation programs — Sibelius and Finale both offer an extensive range of third-party samples (created by Garritan, Sonic Implants and Native Instruments) to play back their scores. Virtuosoworks took a similar approach with Notion, but what sets their program apart from the competition is the fact that its samples were specially commissioned and recorded by members of the London Symphony Orchestra at Abbey Road Studios. This means that for £400 you get a world-class orchestra playing in a world-famous studio, so you'd better make sure your musical ideas are up to scratch! The samples are an important part of the product and deserve careful consideration — I'll describe them later, but for now suffice it to say that the sound files are presented in Virtuosoworks' proprietary format and cannot be exported to other players. Notion runs on Windows XP and 2000 or Mac OS X, and requires 1.5GB of disk space to install. Installation is straightforward — having copied the program and sample data onto your hard drive, you insert the iLok USB Smartkey supplied with the package into a spare USB port, after which you're ready to launch the program. Registration is not obligatory, but it is recommended that you register both the key and the Notion program in case you need technical support from either company further down the line. The program supports anything from a simple solo instrument part to a full-blown orchestral score, up to a limit of 63 staves. 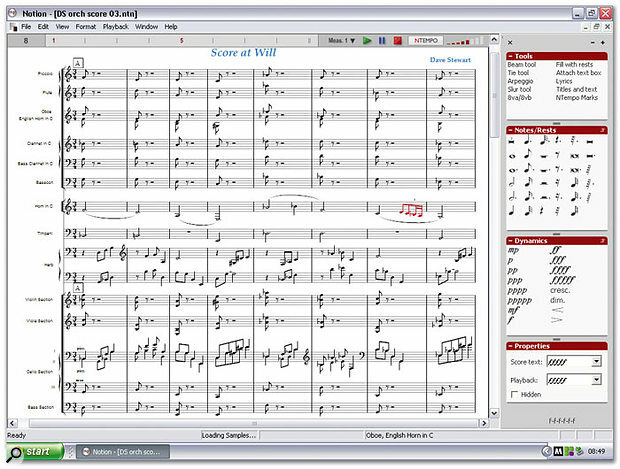 When you open a new file, a Score Setup window appears, with the main instrument groups (Sections) listed on the left. Click on one of these, and a list of its contents opens up under Instruments. Highlight the instrument you want, hit Add, and its name will appear in the Score list. Alternatively, you can introduce whole groups of instruments at one stroke simply by selecting Strings, Brass, and so on, and hitting Add. If you add woodwinds, you'll get the saxophone family as well (no big deal, but I'd prefer to see the saxes listed separately under 'reeds'). The fastest way to create a blank score is to load one of the templates supplied, tweak it to your taste and save the edited setup as your own custom score template. 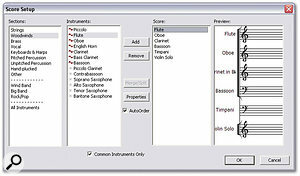 Notion arranges the instruments in traditional orchestral fashion with woodwinds at the top and strings at the bottom, but you can move any instrument up or down the page simply by dragging its name in the Score list. A simple triad scored for violas — Notion plays back the crescendo!One restriction is that each instrument in the score has to be chosen from a predetermined menu. Although the programmers have tried to cover every eventuality by providing a long list of names that runs the gamut from alto crumhorn to zither, there's no 'blank instrument' option. If you want to write a part for an instrument that's not on the list (say, an Indonesian gender metallophone), you'll have to load another instrument and edit its name to suit — and although the edited name appears in the actual score, the old name still appears in the Score list, which is a bit confusing. Virtuosoworks are considering an upgrade to address this. Another current limitation is that all the transposing instruments in Notion play back their parts as a real player would — in other words, if you a write a note of C for a B-flat trumpet, it will appear in the score as a C but be played back as a B flat. For musical clarity, I prefer to create my scores at concert pitch and deal with transposition issues later when extracting individual parts. Fortunately, most of the transposing instruments have an 'in C' version which you can select to hear concert pitch, but the French horn in C, bass clarinet in C and double basses play back an octave lower than written, while the piccolo, xylophone and celeste always sound an octave higher. There is currently no way to create scores which notate and play back all the sampled instruments at concert pitch, but Virtuosoworks have promised to add this facility as a free upgrade in late summer or early autumn. 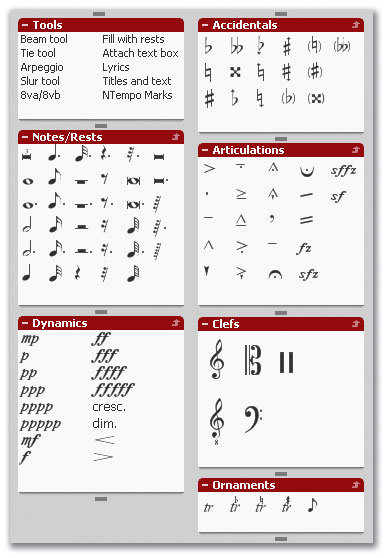 A related, minor issue is that viola parts are automatically created on the alto clef, which few of us are used to reading — however, if you want to change this to the more familiar treble or bass clef, Notion will automatically reposition the notes for you! Some of Notion's 'Sidebar' windows.Before entering any notes, you have to choose a time signature. All of Notion 's musical symbols are listed in a panel on the right of the screen, with the most common meters listed under 'Time signatures' in the Entries window; less common signatures such as 5/8 can be created by selecting Other and writing in the upper and lower numbers. 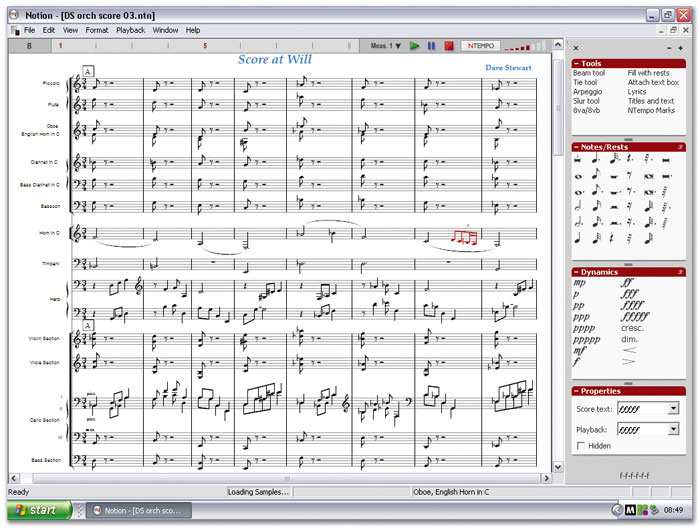 Clicking on any item in the panel attaches it to the cursor; the symbol can then be moved around the score with the mouse and dropped into place on the stave with a single click. To detach the symbol from the cursor you simply hit Escape. Creating notes on the page is a very quick procedure — to notate a simple four-beat tune, you attach a quarter note (aka crotchet) to the cursor and move through the bar from left to right dropping the notes into position. If you accidentally enter too many notes for the time signature you've selected, Notion will mark the superfluous notes in red, warning that a new bar is required to accommodate them. To create one, grab a bar line from the 'Bar lines / Related marks' box and drop it into place to the left of the first red note. The note will turn black and become the first note in your new bar. Notion automatically takes care of note spacing, so all you have to do is drop notes and rests into their approximate positions and the program will snap them into place. One frustrating limitation is that a wrongly placed note can't be dragged to a new position — instead, you have to delete it and insert a replacement. Recent erroneous entries can be undone with Ctrl/Apple-Z, or you can highlight the offending note and hit Delete. Key signatures are entered in the same way as time signatures, and can be customised to accommodate user scales. If you prefer to dispense with key signatures and notate sharps, flats and naturals as they occur in the score, you'll have to add them individually after the event — to write a B flat, you have to first create a note of B, then add a flat symbol in front of the note. This slows things down a little, but by using your keypad and Virtuosoworks' handy chart of keyboard shortcuts, you can quickly select a flat by hitting '2', a sharp by hitting '3', 'q' for a quarter note, 'e' for an eighth note, and so on. Dotted notes are selected by pressing 'd' on the keypad after you've selected your desired note length. An example of 'rhythmic respelling'. Though its notes fit into 3/4, the upper part is theoretically incorrect and Notion's 'respelt' version on the lower stave is musically more apt.Rebarring a score is somewhat beyond the scope of the software — if you've written a piece in 4/4 and decide you'd rather see it notated in 2/4, it is possible to change time signature retrospectively, but Notion will continue to treat the score as if it were in 4/4, displaying all the notes played in the second half of the former 4/4 bars in red. In this particular situation, it's possible to make everything fit into 2/4 simply by adding extra bar lines by hand, but rebarring (say) a 4/4 passage in 9/8 would require such a large amount of note editing that it would probably be quicker to notate it from scratch. Notion does, however, support 'rhythmic respelling' and can rectify theoretically incorrect rhythmic groupings. The manual, which is generally very lucid and helpful, doesn't explain how to achieve this, but I discovered that highlighting the notes within a bar and hitting Backspace sometimes did the trick. However, when the function worked, it invariably introduced an extra random note at the end of the bar, which I had to delete by hand. You can see a short score I created with Notion in the screen below. Entering the basic notes was quick and easy: to create the divisi (divided) cello parts I found it convenient to notate the first and second cellos' parts separately, then merge them onto one stave. (Notion does this kind of merging and splitting of parts extremely well, supporting up to two independent parts on a single stave.) 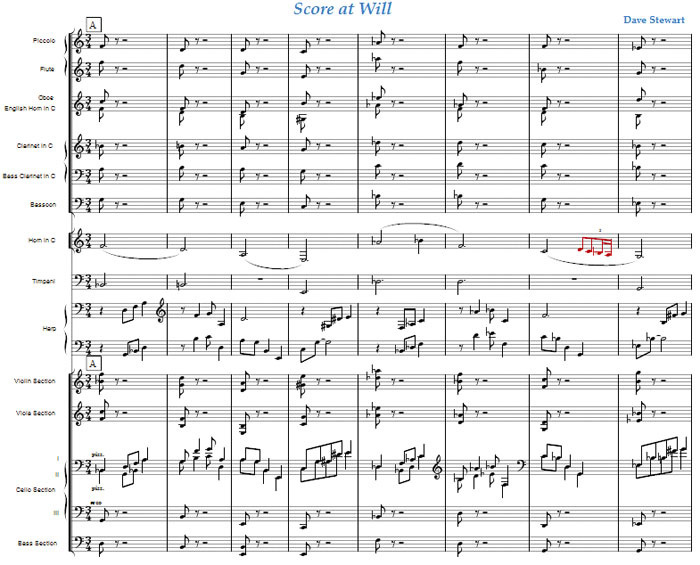 For speed's sake, I tried the program's 'fill incomplete measures with rests' facility to add all the rests in the woodwind parts, but Notion placed them a line too high (presumably due to a bug) so I ended up writing them in myself. The only real problem was the horn melody at bar seven, beat three — the combination of eighth and 16th notes within a triplet seemed to enrage Notion, and it demonstrated its displeasure by marking these notes in red! Avant garde composers might find Notion lacking some of the more complicated markings they like to torture musicians with, and there appears to be no way of importing graphic symbols. From my point of view, a more significant omission is the lack of support for drum kit notation. In this, crosses replace standard note heads for hi-hat and cymbal parts, with a small circle placed above a cross denoting an open hi-hat — you also occasionally see circled note heads used to indicate tom-toms, and bracketed notes indicating 'ghost notes'. Stava has no crosses, circled or bracketed notes, though it does supply 'diamond head' notes for percussion. Currently the only way to write out a hi-hat part in Notion is to adapt a French horn part, using the small circle used to indicate an unstopped horn note and the 'plus' sign used for a stopped one to double as open and shut hi-hat symbols. I tried to write out a couple of bars of drum-kit notation using diamond-head notes for the hi-hat and standard notation for the rest of the kit — all went well until I added the kick and snare beats, at which point the hi-hat notes positioned above them changed from diamond heads to conventional notes. It would be nice if Notion was more flexible about such things. Broadly speaking, there are two types of composer: those who write music straight onto the page, and the ones who write music primarily by playing it. I fall into the latter category, along with, I suspect, most of SOS 's readers. Happily, Notion can be used by both camps, and for player/composers the facility of playing parts in over MIDI is a very welcome option. To create my mini-score I used real-time MIDI input, which gives a click at the tempo of the piece and inserts your played notes in the first available empty bar as soon as you start playing. Although this feels like a familiar operation, playing parts into Notion is very different from working with a sequencer. There's no MIDI editing, playing velocity and sustain pedal activity are ignored (playback dynamics are determined by symbols — p, mf, f, crescendo marks, and so on), you have to set the quantisation value before you play, and you can't hear the rest of the score while you're creating a new part. From a creative point of view, the latter is a big drawback, and something Virtuosoworks should remedy if they want to appeal to the sequencing community. Having said that, one should bear in mind the company's words on the subject: "MIDI entry in Notion is not for the purpose of capturing an exact MIDI performance, but rather to generate useful notation quickly and efficiently." 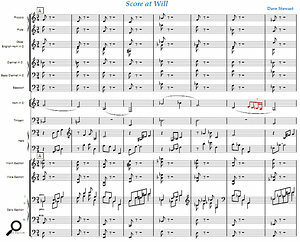 A short orchestral piece by your author, notated by Notion.Sampled instruments must be chosen from Virtuosoworks' menu — if you select 'alto crumhorn' and change its name to 'clarinet', you won't hear a sampled clarinet, but the default piano multisample used by the program to play back any instrument not in its sample library. There is no 'assign part to sound' function. When playing in a part, you always hear the instrument's basic delivery — performance style variants such as pizzicato, tremolo, trills, rolls and accents only become audible when you've added the appropriate symbol to the score. In addition to real-time playing, you can use step time and 'stretch time' entry, both of which allow notes to be entered out of tempo, to input notes over MIDI. Sadly, despite faithfully following the manual's instructions, I couldn't get either method to work. I also imported a MIDI file created in Logic, and here too the results were disappointing: the lyrics of the song were ignored, many of the single-line parts in the backing ended up inexplicably reproduced with two voices on one stave, and despite my carefully setting up a list of General MIDI instruments in the Logic file that I assumed Notion would be able to match, I ended up with a score consisting largely of grand pianos. To fix all the notational problems in this short piece would have taken about as much time as writing it all in again from scratch. Hopefully Notion will do a more precise job of importing XML files from other sequencing programs. On playback, each part has its own volume, panning and reverb settings. A separate tempo track allows for rubatos and accelerandos, and playback speed may be varied live by tapping a key on the computer's keypad. It's also possible to repeat a section an indefinite amount of times before going on to the next — good for live improvisations. The ability to mute and solo parts means that solo instrumentalists or groups of players can use Notion to practise playing along with a full orchestral backing, a great asset when teaching music in schools. Nowadays there are a lot of products which can output professional-looking music scores. In the USA, many composers use Finale (www.finalemusic.com), a long-lived program which has reached a high degree of sophistication. Another popular US make is GenieSoft's (www.geniesoft.biz, formerly Cakewalk) Overture, endorsed by Chick Corea and supported by Gary Garritan, creator of the Personal Orchestra library. Since Windows and Mac versions were released in the late '90s, the British contender Sibelius (www.sibelius.com) has swept all before it and now challenges Finale for world dominance. Sibelius users include contemporary composers Steve Reich and Symon Clarke, jazzers Django Bates and Pat Metheny, and the unclassifiable Jamie Cullum. Like Finale, Sibelius is immensely detailed and produces beautiful-looking scores. If you want to combine sequencing and/or recording with score or part-writing, Apple's Logic Pro (www.apple.com/logicpro) contains a very decent notation page. (To produce the best results, it's advisable to create a separate 'score' version of your Logic Arrangement which you can optimise for notation purposes.) Before buying any of these products, make sure the program offers the particular features you need — many companies now offer free demo versions which are an excellent way of evaluating software. So, you've got the London Symphony Orchestra (or various bits of it) assembled in Abbey Road Studios ready for action — bows are poised in readiness, lips pressed to mouthpieces, mallets held aloft — the baton is raised and an expectant hush falls over the control room. A sudden attack of flatulence in the trombone section could ruin the occasion, but happily that didn't happen here. Virtuosoworks' samples are cleanly recorded with no trace of extraneous noise, and the grand, natural room reverb of Abbey Road Studio One reminds us why it's been used on so many film soundtracks. Notion 's four string sections — violins, violas, cellos and double basses — are of uniformly excellent quality and on a par with the best sample libraries out there. Played with an expressive but not excessive vibrato, their samples sound big, expansive and luxurious, with plenty of 'room' in the sound. (The room decay sounds at the end of samples in the manner of release triggers, and its volume can be separately adjusted for each instrument in the mix.) The strings' pizzicatos and tremolos sound great, and in combination with the library's superb harp, will make your score sound very classy indeed. There are no solo strings at the present time. The woodwinds aren't bad: the oboe player employs a nice vibrato, and the mellow tone of the clarinet and bass clarinet blends well with other instruments. The flute is too reedy for my taste, but the piccolo has an agreeable lyrical quality. As there are no staccato or short woodwind notes in the basic library, the all-purpose long-note samples have to cover a lot of ground. They don't sound convincing in fast-note passages, but for melodies and woodwind ensemble chords they sound very pleasant. In the percussion department, a nice set of Rototoms, a crisp orchestral snare and a pretty glockenspiel caught my ear, but there are no duds here — everything in this extensive percussion instrument list is well sampled and very usable. Unfortunately, the same can't be said for the brass; although the French horn and tuba sound passably realistic, the trombone and trumpet don't. The trombone's warm tone has been lost, and its simulation here reminded me of a harmonium. The trumpet is truly terrible — for some inexplicable reason, it sounds nothing like a trumpet. (I would have identified it as an oboe in a blindfold test.) For the sake of sonic credibility, I'd advise Virtuosoworks to replace this sound immediately. Each instrument appears to have been sampled at two dynamic levels — a 'normal' mf dynamic for unaccented notes and a louder, more emphatic delivery which kicks in when accents are used. All the sustained notes are looped. Taken as a whole, this collection of instruments sounds impressive when playing back a score, though the general performance limitations and weak brass samples somewhat reduce the overall realism. Only two of the expansion kits (Expanded Strings 1 and Expanded Percussion 1) were available at the time of writing, but it seems that Virtuosoworks are committed to supplying a complete orchestral instrumentation, as well as eventually covering other genres such as jazz, rock, world music, and so on. An enormous amount of work and musical expertise has gone into combining this notation software with full orchestral playback. The work is not over — there are still bugs to be ironed out, functions to be added, instruments to be recorded and so on. But as it stands, Notion is capable of creating decent-looking scores of great visual clarity, whose parts can easily be extracted and handed to real players. The integrated playback means that you can quickly hear your ideas with a minimum of fuss, which should be a great encouragement to novice composers. Despite the occasional glitch, I found it great fun to work with, and hearing the LSO play back my keyboard parts was creatively inspiring as well as gratifying to the ego! If the Virtuosoworks family team stick to their guns and continue to develop the program along the lines they've already established, Notion should win many fans from both sides of the orchestral/pop divide. 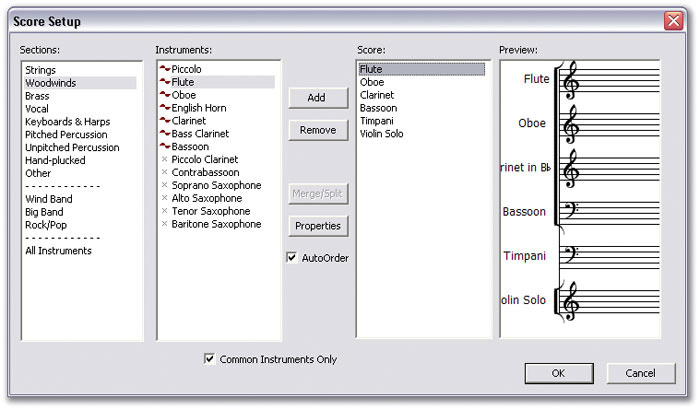 The sampled instruments shown below are included with the basic Notion program, with the exception of those marked with an asterisk, which are available in separate sound expansion kits. At the time of writing, these consist of Expanded Strings 1, which contains 336MB of additional playing techniques for the four string sections, Expanded Woodwinds, which adds contrabassoon, Eb piccolo clarinet, staccato and flutter-tongue samples for other woodwinds, Expanded Brass, with euphonium and stopped horn, plus flutter-tongue and straight mute sounds for other brass, the 123MB Expanded Percussion 1, which adds the percussion sounds marked * below and supplementary playing techniques for other percussion, Harpsichord and Saxophones. Note that Virtuosoworks' sound library works only in conjunction with their Notion software and cannot be loaded into external players. Scores are played back by the London Symphony Orchestra, recorded at Abbey Road. Notes can be entered over MIDI. The internal sound library can be augmented with inexpensive expansion kits. Some minor functions don't work properly. No provision for standard drum kit notation. You can't hear the rest of the score when inputting MIDI notes. There's no MIDI output when playing back. The trumpet is a duffer. If you compose music, you'll probably need to write it out at some point. Notion takes most of the strain out of this, as well as accurately playing back what you've written with some world-class (and one or two Neasden-class) sounds. It doesn't work like a sequencer and its samples can't be exported, but it's founded on 100 percent sound musical principles and renders 'the dots' with great precision. £399 (or £269 with educational discount). Expansion kits: Expanded Strings 1 £34, Expanded Percussion 1 £27, Expanded Woodwinds £27, Expanded Brass £34, Harpsichord £20. Prices include VAT. MI7 +46 40 630 6970.